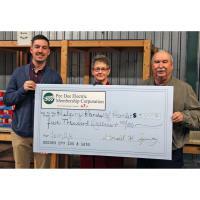 Wadesboro, N.C. (January 23, 2019) – Helping Hands/Backpack Pals of Richmond County recently received a Pee Dee Electric Care to Share grant for a new forklift. The Care to Share program allows members to round their monthly bill up to the nearest dollar amount. In 2018 alone, members donated more than $100,000 that went to local nonprofits across our seven county service area. Backpack Pals is a nonprofit organization that is run solely by volunteers. Every week, the volunteers load over 600 bags with food for school children who may need meals at home. Local veterans then drive the bags to every school in the Richmond County area. The Care to Share funds will replace a 1955 forklift that is used to load pallets into the delivery van. Care to Share grants are available to nonprofits that support the community across Pee Dee’s seven county service area. Grants are awarded four times a year and organizations can apply every three years. Pee Dee Electric is a not-for-profit cooperative whose goal is to provide reliable, dependable electric service for its members while focusing on value, quality customer service, and enhancing life in the communities we serve. Pee Dee’s service area consists of Anson, Richmond, Union, Stanly, Montgomery, Moore, and Scotland counties. For more information about Pee Dee Electric, please visit www.pdemc.com; Like us on Facebook at PeeDeeElectric.NorthCarolina; or follow us on twitter.com/PeeDeeElectric.